The taste of fresh, steamed broccoli is beyond awesome. Steaming is categorized as one of the widely employed cooking methods for the preparation of veggies. It involves the use of steam and heating water for making the veggies tender and edible. Steaming assists in preserving the nutrients present within the broccoli and adds a rich quality to the flavor. You may top it with tamari, salt, pepper, tad bit of butter, some soy sauce and a little bit of toasted sesame oil. Do you want to know more details about how to steam broccoli? Read on this article. Who doesn’t want to get things quickly done? Certainly microwave answers your prayers. So steaming can be conveniently carried out in microwave. However, remember that it may be a little tricky to get the veggies cooked up to the desired and precise level. Here’s what you must do. Take a bowl and add the fresh broccoli florets in it. The broccoli florets should be washed and keep some water present in them, because this will help in formation of a small water pool in the bottom. If it is not , add a tbsp. of water. Place this bowl in your microwave for approx. 1 minute at high heat and make sure it’s all covered up. Check if it’s done to your desired level of tenderness or not. If it’s not, then repeat the similar steps after an interval of every 30 second until it meets your desired satisfaction. A number of people find themselves in the comfort zone when they plan to steam the broccoli in a pan. Here’s how you can steam your broccoli in a pan. Peel off the stalks of broccoli, separate the florets and cut them into 1 inch pieces. Now take the stalks and cut them into halves crosswise, and then cut every individual half into thick slices of 1/8 inch lengthwise. Take a sauce pan and add the stalk pieces in it along with salt and water. At top of this, place the florets and cover the pan. Cook it for 3 minutes at high heat followed by cooking extra 3 minutes on low heat. Then it is ready. Make sure you serve it right away. Top it with butter or soy sauce to make it taste more heavenly. The classic method to steam broccoli involves a steamer basket or insert. 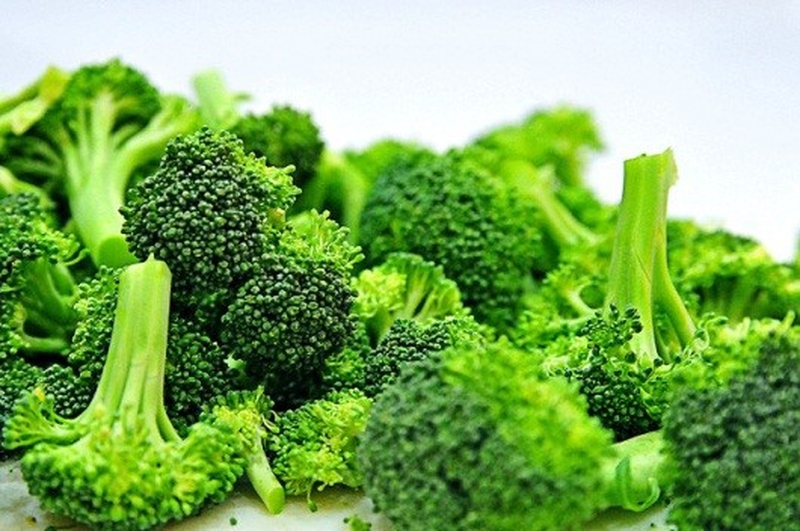 Here’s how you can steam broccoli using a steamer. Fill almost an inch of water in a steamer pan. It must be noted that the steamer basket should not be submerged in water, instead, it should be above it when aiming to steam. Put the steamer to the medium-high stove heat. Place the lid and allow the water to boil. Meanwhile cut the florets into edible pieces and try to cut the stem off as much as you can. After the water reaches the boiling point, remove the lid, add the florets into the steamer basket and put the lid back again. Make sure that very little steam escapes when you add the florets. Set your timer for accurate 5 minutes and let the broccoli florets steam within the basket without disturbing the process by lifting up the lid over and over. As the timer goes off, place the steamer away from the heat. Now place this steamed broccoli in a serving bowl with a lid. You may also use a plate as a substitute of a lid if you don’t have any. Add a dash of salt and pat the broccoli with 1-2 tbsp. of butter. Cover the bowl with a lid and allow it to stay in that way for a minute or two or until the butter melts down. Toss the steamed broccoli in the melted butter to thoroughly coat. And then your steamed broccoli is ready for serving. Once you are done with steaming the broccoli, you may try this easiest and delicious recipe to make your meal worthwhile. It’s all about how lemon and garlic can magically make your broccoli taste freaking amazing just within few minutes! In a large skillet, add the broccoli florets and expose it to medium stove heat. In a separate bowl, mix 2 tsp. of lemon juice and water. Add this mixture to the skillet. Place a lid over the skillet and let it steam until the broccoli turns a darker shade of green and becomes tender. This will take about 10-15 minutes. Meanwhile in another pan, melt the butter over medium-low heat. Add the salt and garlic and mix well. At lower heat, allow the garlic to fry until it turns a shade of golden brown. This will take approximately 8 minutes. Now drain the water out from the steamed broccoli and add it back to the skillet. Add 2 tsp. of lemon juice along with the butter mixture in it. Sprinkle some black pepper and toss it to coat adequately. Enjoy! Server responsed at: 04/22/2019 7:54 p.m.